A few weeks after President Donald Trump’s announcement of Neil Gorsuch as his nominee to the Supreme Court, 44% of Americans say they favor the Senate confirming him to the high court, while 32% are opposed; roughly a quarter (24%) offer no opinion. Initial reactions to past Supreme Court nominees have tended to be more positive than negative, though many of the justices were not well known by the public at the time of their nominations. Overall views of Gorsuch’s nomination are similar to views of Barack Obama’s choice of Merrick Garland nearly a year ago. Last March, 46% favored Senate confirmation of Garland, 30% were opposed and 24% had no opinion. Garland was Obama’s pick to fill the seat vacated by the late Justice Antonin Scalia. His nomination was never considered by the Senate. Republicans declined to hold hearings on Garland in order to leave the seat open so the next president could choose Scalia’s successor. 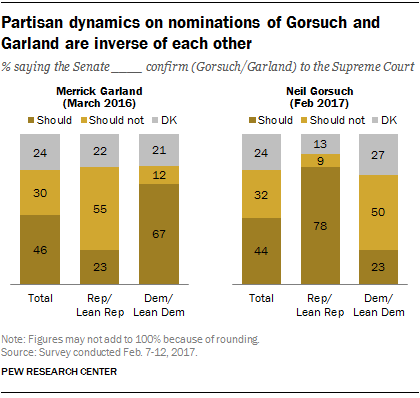 As was the case with Garland, there is a substantial partisan gap over Gorsuch’s nomination. Nearly eight-in-ten Republicans and Republican-leaning independents (78%) believe the Senate should vote to confirm Gorsuch. Only 9% of Republicans are against his confirmation, while 13% offer no opinion. By contrast, Democrats and Democratic leaners oppose Gorsuch’s confirmation by a roughly two-to-one margin (50% vs. 23%), while roughly a quarter (27%) do not offer an opinion. Today’s partisan dynamic is the inverse of partisan views of Garland’s nomination last March. At that time, 67% of Democrats and just 23% of Republicans supported his confirmation. 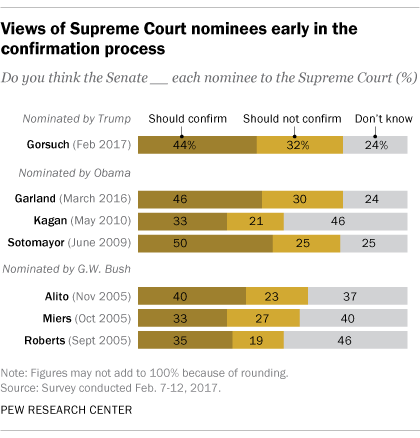 In the new survey, those who said Gorsuch should not be confirmed were asked in an open-ended question why they opposed his confirmation. 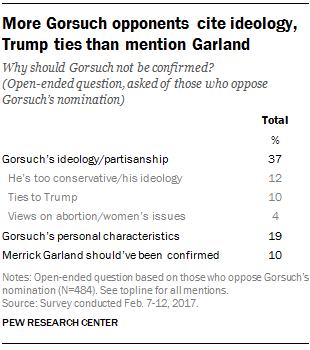 Among the roughly one-third of the public that said this, 37% mention Gorsuch’s ideology or partisanship as the reason why they oppose his confirmation. Roughly two-in-ten (19%) cite aspects of Gorsuch’s personal characteristics, while 10% say the Senate should have confirmed Garland for the same open seat last year. Note: For survey methodology, click here. Topline is available here (PDF).